Are you a good saver? 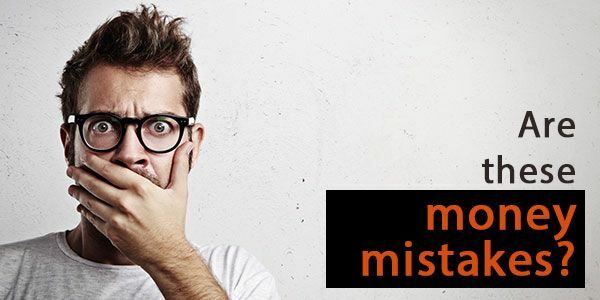 Are you aware of these 6 money mistakes? # Are you able to save a significant amount every month? # Are you happy with what you’re saving? Even if you’re a good saver and have answered ‘yes’ to the above two questions, you may be committing some money mistakes maybe unknowingly. Avoiding these mistakes might help you save more or manage your finances in a better way. You may think it’s a good idea and easy to transfer funds. But, think once - What will happen if you accidentally overdraw your checking account? The bank will automatically debit from your savings account. In fact, many financial advisers are of the view that it’s better not to use any ATM card for your savings account. This way, your savings will remain intact. Making it difficult to access money will help you save more. This is one of the most common money mistakes good savers either don’t know or don’t pay heed to. Our intention should not be to save what we’re left with, but saving at first and spending or meeting our daily necessities with the remaining amount. However, that doesn’t mean that you decide to save 60% or 70% of your income even if your income is not that much. You should decide to save a decent amount and at the same time, it should be a figure, which is not much difficult to save every month. So, decide a figure and set aside that amount just after you receive your paycheck and with the remaining dollars, plan your fixed and variable expenses, along with allotting money for yourself and your family. This is another common money mistake many good savers don’t know. Practically, it is of no use if you save a significant amount and just sit with the money. You have to invest it to get profitable returns in the future. My friend, take advantage of the compound interest and invest it wisely. If required, consult a good financial adviser who can guide you well about this. Do you think that your job is done if you budget your paycheck or consider lump sum amount and ignore the small cash? If you’ve answered ‘yes’, then you’re making a big mistake my dear! Whatever amount you receive, however small it is, think it from the budgeting perspective - save a certain amount and enjoy the rest, or use it to repay debt or reduce it. You can even try to increase the amount of your emergency savings. When was the last time you checked your credit report and score? Don’t remember? Are you sure you’re still maintaining a good credit and are having a good score? You may be unaware if there are some inaccurate negative items in your report which is pulling your score down and staining your report. So, pull your credit reports periodically at least from the 3 major bureaus and check out whether or not they’re correct. If any error, dispute it without delay. Make a note of things you don’t understand and get it clarified. If your family is dependent on your income, it’s your responsibility to make a will. Even if you’re not the only breadwinner, you should make a will. A research conducted by Money magazine revealed that about 57% Americans don’t have a will. This figure includes 65% of parents who have children under 18. So, think and make a good estate planning so that you can decide all yourself. Even if you save well, you need to have insurance policies to guard your finances in times of emergency situations. At least purchase adequate coverage of home insurance, life insurance, health insurance and auto insurance. This will help you secure your financial future and you’ll be stress-free. Another thing which often goes unnoticed is to take into account the small details of your saving and spending. I would advise you make a note of every spending in your smartphone or keep a small diary with you. Keep an account even if it’s as little as $5. This will help you cut down unnecessary expenses if you’re making one. This will also help you plan a suitable budget and attain your financial goals within the time you want to. So, did you find anything interesting?